After signing a contract to play professional basketball in Israel, Drew Edelman had another piece of business to finish up. The UCSB senior submitted her master’s thesis at the Gevirtz Graduate School of Education. “It’s about leadership,” Edelman said. She picked out two prominent sports figures, Rafer Johnson and Lance Armstrong. In Johnson, who had a humble background before becoming a star athlete at UCLA, an Olympic decathlon champion, and a Special Olympics maestro, she found the qualities of a true leader. In Armstrong, whose victories in the Tour de France were tainted by his admitted doping, she saw a failure to fulfill his role. 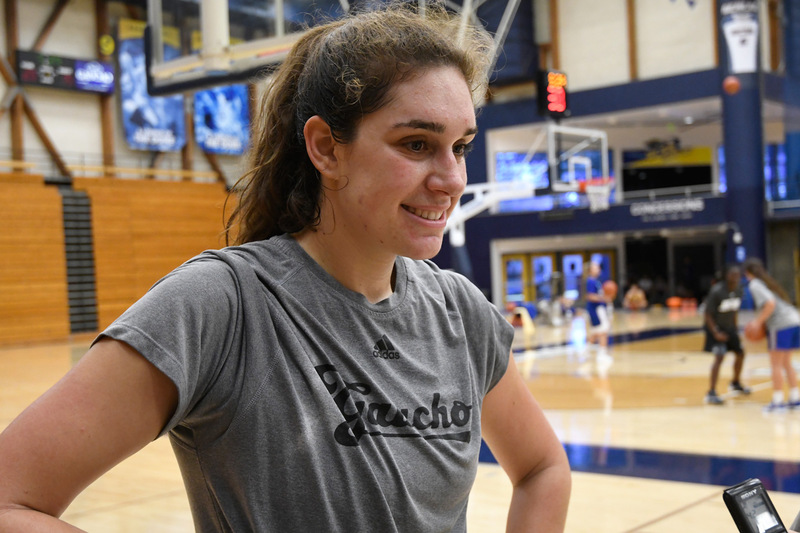 Edelman was a leader for the Gaucho women’s basketball team. She was a two-year starter after transferring from USC, where she earned a BA degree. She averaged 16.2 points and 9.6 rebounds and received All-Big West First Team recognition for the 2017-18 season. The most prestigious honor of all is the Golden Eagle Ring, presented annually by Peter Jordano to the UCSB athlete with the highest grade-point average. Edelman, with a 3.96 GPA in her graduate studies, was the female ring winner for two straight years. The 6′4″ center will start playing this fall in Israel’s Division 1 for A.S. Ramat HaSharon, a professional team in a suburb of Tel Aviv. The Israelis got a good look at her in last summer’s Maccabi Games, where she led Team USA to the gold medal and was named Most Valuable Player of the tournament. PREP WRAP-UP: After winning 2017-18 CIF championships in girls’ water polo and boys’ basketball, San Marcos High came close to a rare triple last weekend. The Royals advanced to the Division 4 softball final, where the pitching and defense of the Santa Fe Chiefs subdued them, 3-0. In baseball, Capistrano Valley, the team that knocked Dos Pueblos out of the quarterfinals in extra innings, went on to win the Division 1 title. San Marcos track-and-field standout Allie Jones had a good day at the State CIF Championships in Clovis. The Stanford-bound senior placed fifth in the girls’ 100-meter hurdles (13.87 seconds) and seventh in the long jump (18′5″). Beau Allen, a junior who also played for Royals basketball champs, soared 6′8″ in the high jump to place fourth. 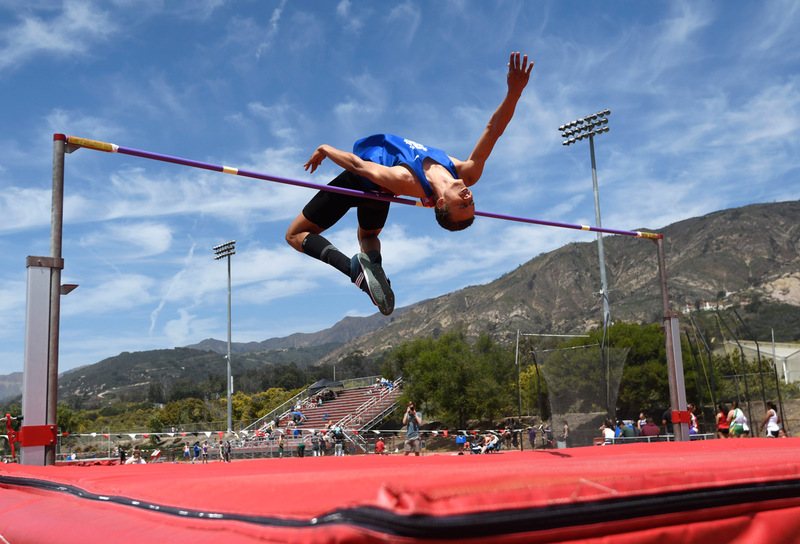 Santa Barbara High’s Devon Cetti, who will attend Cal Poly, placed seventh in the shot put with a mark of 57′9¾″, and Dos Pueblos junior Josephine Morales cleared 5′6″ to tie for eighth in the girls’ high jump. COLLEGE FINALS: Three Santa Barbara City College athletes achieved All-America honors at the State Community College Track & Field Championships. Brian Nnoli spanned 47′8″ on his last attempt in the triple jump to record a personal best and finish in third place. Swedish sprinter Marie Kimumba also finished third in the women’s 400 (56.50) and fourth in the 200 (25.31), and Alana Ochoa took fourth in the discus (137′9″). Nnoli and Ochoa are San Marcos grads. Westmont College sophomore Pieter Top won the decathlon at the NAIA Championships. His final score of 6,833 was the best by a Warrior in 35 years. Also finishing as All-Americas were Westmont’s Michael Oldach (second in the men’s 1,500), Seth Wilmoth (third in the pole vault with a school-record 16′¾″), and Emily Parks (third in the women’s 400 hurdles). Jenna Hinkle and Hope Bender of UCSB will compete in the NCAA Championships at Eugene, OR, this weekend. Hinkle qualified at the Western Regionals by breaking her own school record in the 1,500 with a time of 4:15.39. Bender won the Big West Conference title in the heptathlon, scoring 5,561 points. It was announced Monday that Pete Dolan is leaving UCSB after 30 years, and Gray Horn will replace him as interim track-and-field head coach. MILE OF SMILES: The 19th edition of the State Street Mile drew throngs of runners downtown Sunday morning. They ranged from toddlers who escaped their strollers and tottered the last few yards of the YMCA Family Mile — which accounted for the majority of the 1,200 participants — to running legends John Brennand and Don Truex, combined age 163. The Hoka One One Elite men’s race had a mass finish like a bicycle sprint. Dartmouth graduate Connor Clark of Mill Valley was first, in 3:54. Ten others, including Reid Buchanan and Craig Lutz in the same time, broke four minutes. Tracee van der Wyk of Pasadena was the women’s winner in 4:29, a second ahead of Kim Conley, a two-time Olympian. JUSTLY NAMED: Besides being such a good-looking horse, Justify has a name that rings bells with fans of the TV drama Justified. It aired for six seasons (2010-15) and had a gritty texture, much like Breaking Bad, but the U.S. Marshal did not get blown away. Played by Timothy Olyphant, he was imperiled by some very bad dudes but triumphed in the end. Justify had a scare in the Preakness, holding off a pair of fast-closing rivals, and he seems less certain to claim the Triple Crown on Saturday at the Belmont Stakes. But I like his grit and believe that he will win.